Normally when a girl meets a gorgeous new guy and instantly starts to like him, I am a bit wary of the book, but this one surprised me. The author did a good job on making Dante (the gorgeous, foreign guy) really sweet and lovable so you wanted the main character to be with him. I also liked how the author was able to show you that you shouldn't let everyone else make decisions about your own life. It is your life and you need to decide what you want to do with it. 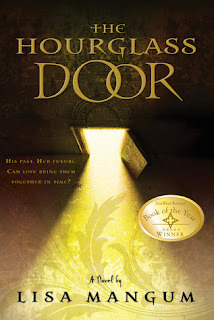 Even though the book had a cliffhanger and I am not a huge fan of those, I found THE HOURGLASS DOOR very interesting and I kinda found it hard to put it down. It is the first in a trilogy.